A Great Horned Owlet fell from her tree after her nest was destroyed in a storm. A basket from Target was secured to the tree and the parents came back and used the basket as a nest for the rest of the season. Supplies are also very welcome and you can donate them too! Here’s a list of some things that are always needed at Wild Things. 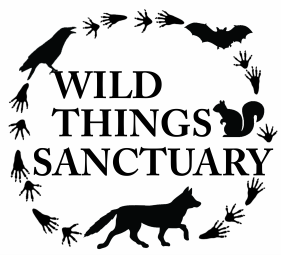 For those who work in a hospital or vet clinic, can you save Wild Things any supplies? Hospitals throw away hundreds of dollars worth of medical supplies that can be used in wildlife rehabilitation, such as expired medical supplies and opened but unfinished medications/fluids. Veterinarians are also always welcome to donate supplies & assistance. Before you drop anything off please check with us that it is needed at the current time. Enrichment toys and hideouts. Bats really like the little hideaways that you can buy for pet birds. Gift certificate from Chris’ Squirrels and More, a place that carries so many things that every rehabilitation center needs! Gift certificates to places like Target (the basket in the above photo was a Target basket that ended up being a great new nest for a Great Horned Owlet! Birodegradeable unscented laundry detergent. Lots of laundry is done at WTS!